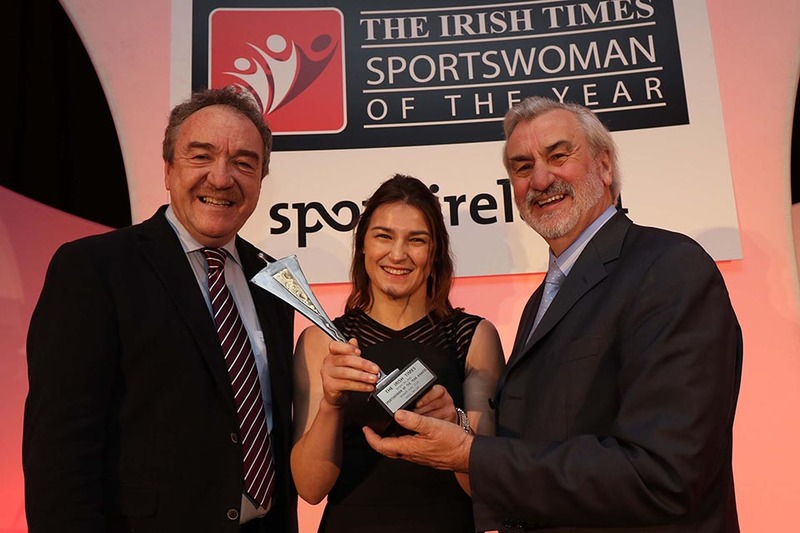 Boxer Katie Taylor was honoured at The Irish Times Sport Ireland Sportswoman of the Year Awards which took place in Dublin last Friday (18th Dec). Katie won the Sportswoman of the Month award for June following her European Olympic gold in Baku. A few weeks ago she added another national title. Katie has won the overall Sportswoman of the Year title four times in the last eight years, winning it last year, in 2012 and two years in succession in 2007 and 2008. Katie was presented with her award by Kieran Mulvey Chairman of Sport Ireland and by Malachy Logan Sports Editor of The Irish Times at the Shelbourne Hotel. Cork dual stars Briege Corkery and Rena Buckley were named overall winners of The Irish Times Sport Ireland ‘Sportswoman of the Year Award 2015’. The Cork camogie and gaelic football players won the award for their record breaking achievement in becoming the most medalled women in the history of Gaelic Games. The duo were joint winners of the Sportswoman of the Month award in September when they each won their 16th All Ireland medals in Cork’s football victory over Dublin. This is the 11th year of the awards and the Cork players were among 14 sports stars nominated for the 2015 title. One of Ireland’s greatest runners, Catherina McKiernan was presented with the Outstanding Contribution to Women’s Sport 2015 Award. Guest of honour Tánaiste Joan Burton congratulated all the award winners on their magnificent sporting achievements and wished them continued success into the future. The Sports Editor of The Irish Times Malachy Logan described the nominees as a group of exceptional people who were a credit to themselves, their parents, partners, coaches and friends. Kieran Mulvey, Chairman of Sports Ireland said: “The continued success of Irish sport is so important for the country in terms of recognition, reputation and morale. It is the dedication and commitment of all our athletes, their coaches and support teams that put Ireland on the map in such a positive way. Sport Ireland is proud to be part of today’s awards which recognises the incredible contribution of Irish women in sport”.